Basically defined, nursing is the care of others or a profession within the health care sector focused on the autonomous (a. 自主的,独立的) and collaborative care of individuals of all ages, families, groups, and communities, sick or well and in all settings. The care may involve any number of activities, from carrying out complicated technical procedures to something as seemingly simple as holding a hand. Nursing includes the promotion of health, prevention of illness, and the care of the ill, disabled, and dying people. Originated from the Latin word nutrix, meaning “to nourish,” a person who nourishes, fosters, and protects and who is prepared to take care of the sick, injured, and aged people. ANA is the professional organization for RNs in the United States. It started in 1896 as the Nurses Associated Alumnae and was renamed the American Nurses Association in 1911. Its primary mission is establishing standards of nursing practice, promoting the rights of nurses in the workplace, and advancing the economic and general welfare of nurses. It also has three subsidiary organizations: (1) American Academy of Nursing, to serve the public and nursing profession by advancing health policy and practice through the generation, synthesis, and dissemination of nursing knowledge; (2) American Nurses Foundation, the charitable and philanthropic arm, and (3) American Nurses Credentialing Center, which credentials nurses in their specialty and credentials facilities that exhibit nursing excellence. Its membership is composed of the state nurses’ associations to which individual nurses belong. 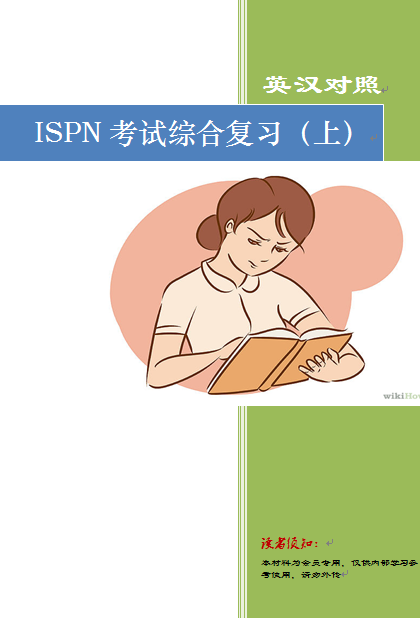 An independent, not-for-profit organization through which boards of nursing act and counsel (v. 商议,劝告) together on matters of common interest and concern affecting public health, safety and welfare, including the development of nursing licensure examinations (n. 核发执照，许可证). Its primary mission is to protect the public by way of ensuring that nurses practice competently and efficiently. This task is fulfilled by its members, Board of Nursing in each state or province. A regulatory body that oversees the practice of nursing within a defined jurisdiction (n.管辖范围), typically a state or province and handles all aspects of nurse licensure within its jurisdiction. The board typically approves and oversees schools of nursing within its jurisdiction. It reviews the applicant’s application and determines whether the applicant is qualified for the appropriate NCLEX examination. State and territorial boards of nursing comprise the National Council of State Boards of Nursing.